(...) aina kun Latvian radiokuoron julkaisee levyn, kyseessä on merkkitapaus. 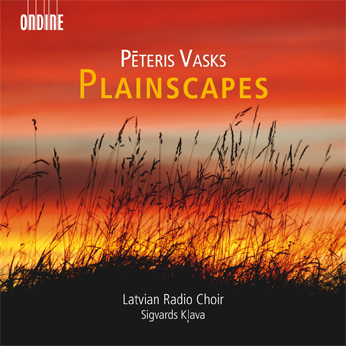 This CD presents a cross section of a cappella choral works by cult composer Pēteris Vasks, performed by the acclaimed Latvian Radio Choir under the direction of Sigvards Kļava. Following on from their successful recording of liturgical Vasks compositions ("Beautifully performed, a rare outing for Vask's choral music" - Gramophone) (ODE 1106-2), the Latvian Radio Choir once again draws on the Baltic countries' extraordinary choir music tradition, focusing here on secular repertoire. The title piece on this disc is Plainscapes, written in 2002 for mixed choir, solo violin (Sandis Šteinbergs) and solo cello (Guna Āboltiņa) on commission from violinist Gidon Kremer; meditating on the inspiring beauty of the Latvian lowlands, it uses vocalises to celebrate nature's cyclic miracles. The Sad Mother (1980/91) and Summer (1978) are written for female choir. In Birth (2008) a mixed choir, together with a solo percussion (Jānis Kokins), pays tribute to the sun as a symbol for life. The present release features world premiere recordings of Our Mother's Names (1977/2003), The Sad Mother (1980/91), Summer (1978), and Small, Warm Holiday (1988). Ondine's releases of Peteris Vasks' music have garnered several awards, including a 2004 Cannes Classical Disc of the Year Award for the Second Symphony (ODE 1005-2).